Rob Waker, owner of RAW Plumbing Services Ltd based in Basildon, Essex, has rated the BoilerMag domestic heating system filter 10/10! Rob’s business is focused on providing outstanding service to his customers; not only doing the job correctly, but fitting high quality products to compliment the high standards of workmanship he achieves. 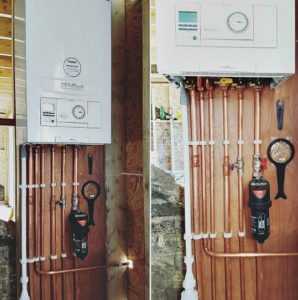 As a plumbing and heating company, RAW Plumbing Services Ltd regularly carries out boiler installs and bathroom fit outs, and prides itself on being approachable to customers. As part of doing a good job for the customer, Rob and his staff always endeavour to keep the homeowners property clean and tidy in the process. The BoilerMag domestic heating system filter uses patented magnetic technology to ensure that virtually 100% of ferrous oxide and scale is removed on first pass through the filter. The unit can be installed or cleaned in minutes, making it a popular choice for plumbers such as Rob at RAW Plumbing Services Ltd. As mentioned above, a spare pack of seals is supplied in the box, which can conveniently be left in the property in which the installation took place, or the installer’s van should they be needed.